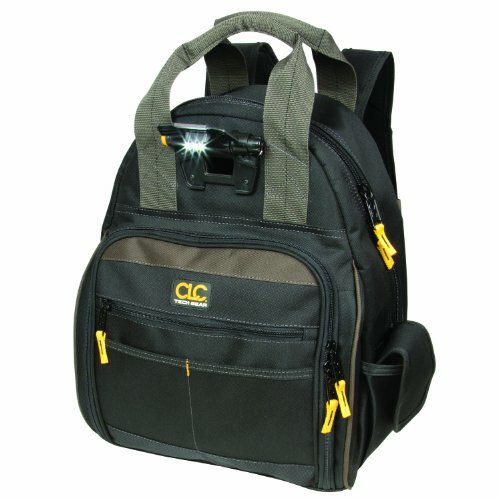 Our Tech Gear dual compartment 53 pocket LED lighted tool storage backpack features an integrated 3 level LED light that swivels, 2 straps for cordless drill/driver and battery charger, carrying handles, padded shoulders with sternum strap and back padding. BUILT-IN LED LIGHT: Can be easily directed at work area or into tool carrier to help identify tools and parts. 3 Levels of light output allow adjustment for wide area illumination or close-up work. 53 POCKETS FOR EASY ORGANIZATION: 28 Tool pockets, 14 accessory bit pockets and 11 multi-use pockets for your favorite tools, parts and accessories. Dual compartment design for better-organized tool storage. CONVENIENT AND COMFORTABLE: Carrying handles for easy transport and adjustable padded shoulders with sternum strap and back padding for comfort. STRAPS FOR LARGER TOOLS: 2 Straps for cordless drill/driver and battery charger.